Just a short post today to tell you that my Christmas present finally got finished. My husband Dan and my friend Dan built a Little Free Library for me, out of scraps we had in our garages, and my friend Holly painted it to match our house. It only took contributions from a couple of people, and we were in business – the business of book exchanges. Little Free Library was started by a Wisconsin man in 2009 as a way to honor his deceased mother, a teacher. Now there are thousands of Little Free Libraries in the United States, and some in other countries, as well. It’s really just a book exchange – in my front yard. I tell people “Take a book, leave a book. Take a book, return it later. Take a book. Leave a book.” We’ve had no trouble keeping it stocked, and we’ve had quite a few exchanges in our first week. It’s been so gratifying to see neighbors stop by or to receive an email from a neighbor I’d never met telling me what she’d taken and what she’d left. One neighbor even brought me some books and some cuttings for my garden after seeing my house on Google Maps. I promoted the library on our neighborhood listserve, a Yahoo group that frankly, I think every neighborhood should have. It keeps us connected, lets us know what’s going on in the ‘hood, and is frequently the starting point for “one man’s trash is another man’s treasure” swaps. The first day the library was finished, I listed all the titles we have on the listserve in an email titled “Need something good to read this weekend.” Most of the original books from that email have already been swapped. Do you have any electronic equipment that no longer works or you just don’t use anymore. Perhaps it is time to sell it off or dispose of it appropriately. Don’t just throw old electronic equipment in the garbage. Investigate eWaste drop off’s sites or events in your area. You local government web site will usually carry this sort of information. Love it! What a neat idea! I explored the Free Little Library website and discovered that there’s one very close to where I live here in Michigan. Thanks for sharing. Fun! You’ll have to check it out. In tree trunks! I LOVE it!! I fell in love with the idea as soon as I first heard of it, and if I had a front yard, I’d set up one myself. Thanks. You can try one in your building or church or other gathering place. What a great idea. We have something like this only bigger in our clubhouse here in the community. I’m thinking of doing something similar for our church. We meet in an elementary school so must move in and out every Sunday. I’m thinking about doing a library on wheels. I even have someone I think will build it. Kim, I hope your garage sale goes well and you sell everything. That would be great. Happy moving. There is something kind of like this at my local coffee spot. A bookshelf crammed with books of every genre, and the only rule is that you have to bring a book to take a book. I have been taking advantage of it as a place to just leave books (take one, leave 4). Its a fun thing to do and helps me expand my reading experiences into different genres or authors than I would normally try. This would be a great thing to set up at my favourite coffee shop. Wendy F and I have already convinced them to start suspended coffees and that is going well and it go them a write up in the paper. A book shelf would be great. A games shelf would also be great. Hi Colleen what are suspended coffees? Leah and Colleen – yes I’m curious too. Your little library is adorable! Thank you. It did turn out very nicely. Also, it survived 3 1/2 inches of rain without getting a drop inside. Hurrah for the library and hurrah for the rain. Love your library. Wish I could do this in my front yard but my husband is not a fan. He says that’s what the library is for. My hairdresser has set up a little book swap at the hair salon and I take books there and leave others. I am a big fan of the take 1 leave more style,too. Sometimes there is nothing I am interested in but I still leave the ones I brought. An easy way to pass them along. FYI – I’m down to my last book from the library and have started reading from my own stash today. YIPPEE! I love it too, even though I am not much of a reader. I was very pleased to encounter a book swap in a shopping centre in the middle of the Melbourne CBD. Got to love Melbourne of that sort of thing. It is such a great City. Thanks for another great post Cindy. I hope you inspire other readers to do the same. Absolutely love this idea!!! At work, we do something similar–except we store the books in a boring metal cabinet… So jealous of your library!!! Enjoy it! Great idea Cindy! We have always donated our books to a well known charity that sells them for a small amount as a means of fundraising. If they ever stop doing that I would love to start one in my front yard or encourage my local coffee shop to try the idea. Fantastic idea and looks cute too! For people in Sydney, NSW there is also this mob – http://footpathlibrary.org/ – who give books to homeless people. They are quite strict about what they take, but that’s so their clients are protected from trashy or innapropriate stuff. I recently sent a brand new duplicate Donna Leon mystery to them that no-one on eBay wanted. The site also has some ideas for getting rid of good books that are not the kind of thing they want. Today’s mini mission – well, its a good one for me. Last Friday I was looking for something in the drawers in the buffet/dresser in the dining room and realised how untidy this had gotten. So I pulled everything out of all three drawers and spread out over the dining room table and what a hodge podge collection there was! The top drawer had obviously turned into a “I don’t know what this is or I don’t know what to do with this item so I will put in the drawer” zone. Does anyone else have such a zone? I also found a cordless phone base, I have reason to believe that we no longer have that phone unit – and a spare battery for the remaining cordless phones. As this model of phone is no longer made I think I probably should keep this battery but will relocate it to our battery box, so we can find it should we need it. the both the girl’s Nintendo DSi game consoles with travel cases and a small bag of accessories. Courtney wants to sell hers, I doubt we’ll get much for it, but out the door is out the door. Dayna says she has a couple of games that she does like to play from time to time, so I’ve asked her to keep it in her room with the small box with the last few games that we have. In general she’s a minimalist so I figure if she wants to still keep it, she must have a good reason. So today’s mini mission is ideal for me. Aside from that there were 3 boxes of 50 tea lite candles – how did that get past me? I think two boxes came back from the party I hosted for my parent’s 40th anniversary and were put with the ones we keep handy for rare power cuts etc. And an update on all the warranties and instruction manuals that I sorted thru yesterday. I was very pleased with myself as all three piles (we realised we had three locations around the house for these) were culled done to fit in the magazine holder thingee that sat in the small cupboard above my microwave. I was about to put them back in that cupboard when it occured to me that I have a concertina file in the cupboard – this concertina file is all that is left of a two-drawer-filing-cabinet. And is only about a third full. The reason I use this mostly-empty-concertina file (also known as an accordian file) is that it looks an obvious place for documents etc should someone other than me ever needs to locate our papers. And so I’m going to see if these will fit in the concertina file. Which will mean another item out of the house! What a great idea! Really love that! 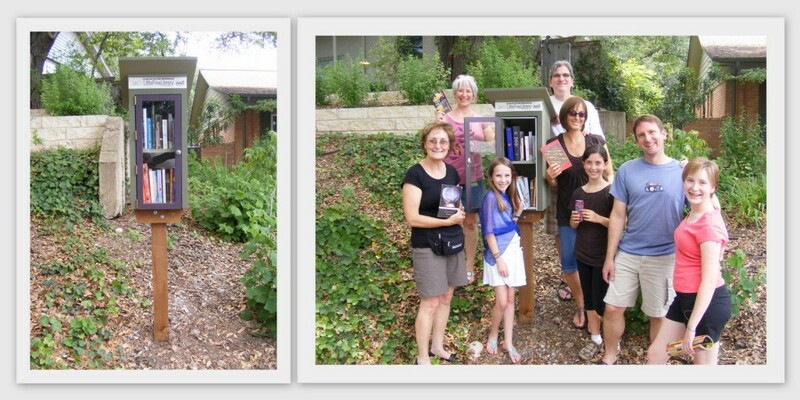 Your “little free library” is fabulous! Bless you. Reading is eye opening in so many ways. Knowledge is power. And, I love to receive gifts that keep on giving, too! You made my day! Mahalo and Aloha! This is an amazing idea! Feeling wistful that it was probably just in the US (I live in small-town Canada) I checked the map of locations at the link you included and – lo and behold – there are several close to me, with one close enough to visit soon – who’d have thought?! Props to you Cindy, both for taking this project on (I’m assuming you asked for it 🙂 ) and for spreading the word. I’ve never heard of this before, but what a brilliant idea! What a fabulous idea! My husband & I spend a lot of time in caravan parks on our holidays . In the laundrys there is often a pile of books and magazines which people have read. We usually take a few and then leave them at the next park we visit.Next holiday I will be taking a big pile of Australian Geographics that I never thought I would get rid of but now feel I can do so after all the inspiration from this great blog. Joining everyone who has commented. This is a beautiful idea and shows your generosity of spirit, Cindy. If you we’re closer, I would rush over and swap half a dozen of my books for just one book. Can I just add, I know the difference between we’re and were. But my iPad corrects/changes before I even notice. The Little Free Library sounds lovely. Here in the UK we have bookcrossing.com as I think you do in the States. You register a book with a number then leave it at a designated place – we have all sorts here – phoneboxes, cafes, libraries etc. Am about to ‘release’ a book at my local swimming pool! I love the little library idea! We do have a free exchange library here (it’s in an old glass-fronted fridge on an empty section) but that is the only one in the city that I know of. It never occurred to me that there could be neighbourhood versions. Our house is a back section so we don’t have any street frontage, but I may suggest this to other people if the opportunity presents itself. I’ve never heard of Little Free Library before, but what a great concept. I’m jealous because the kids and I have been talking about doing this for a year, and haven’t gotten it finished yet. Guess I’ll have to try asking for it to be completed as a gift. Thanks for the push. Yours looks great! What a fabulously delightful concept. I am amazed. I am wondering how I might do such an idea in an apartment building. Does anyone have suggestions? This is my first comment. I have been reading the blog for a while now, from the beginning trying to reach current. I love this post! I am an avid reader and I admit, a book collector. I am trying to change my ways and I am currently making progress on de-clutter my house and my debt total. Hi Shoeaholicnomore and thank you for your first comment. You are most welcome here. I sent a copy of your comment direct to Cindy so she can possibly reply. I love the LFL idea too even though I am not an avid reader.